Get to know us. You’ll love us. Julie is an adult, female Atlantic bottlenose dolphins at Dolphins Plus Bayside. Born on August 19th, 2007, Julie is nicknamed our “Italian” dolphin because the back of her dorsal fin is rippled like the edge of a lasagna noodle! She also has a birthmark on the right side of her melon that compliments her large and expressive eyes. She is one of the most vocal dolphins in our population and she loves offering novel and exuberant vocalizations when learning new behaviors or simply to express her excitement during a session! Julie is the princess of Dolphins Plus Bayside and is well known for her fun loving personality! "Julie is one of my favorite animals to work with because she is a constant reminder to let your spirit shine! She screams when she gets excited, and is a ball of energy. I just think everyone should be as full of wonder as this dolphin at some point each day!" Leo, a male, Atlantic bottlenose dolphin, was the first dolphin born at Dolphins Plus Bayside! His birthday is July 29th, 2003. He is easily recognized by his light body, pink belly, and hooked dorsal fin. 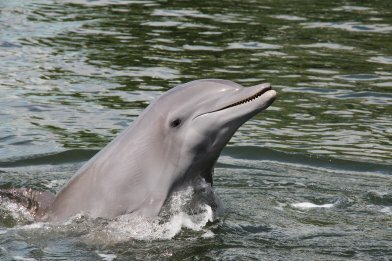 He is a very vocal dolphin and knows over fourteen different vocalizations that he can offer on signal! Leo is also the star of an ongoing research study for a “create” behavior in which Leo offers novel behaviors that are different each time! His trainers have several goofy nicknames for him including Schmeeshmo, Lilo, and Lee! Leo loves a good back rub from his trainers, showing off how fancy he is, getting attention and applause from guests, and “shopping” for presents in his lagoon to give to guests and his trainers! Stop by Dolphins Plus Bayside to meet Leo today! "I am very lucky to have known Leo since birth and can best describe him as Dolphin Cove's impressionist dolphin extraordinaire! For most of his life, Leo has been mimicking other animal sounds via his vocalizations and has mastered a perfect impression of a seagull. Leo can even “giggle” and impersonate a laughing baby. I love working with Leo because I never know what vocalization he will offer next!" Luna, one of our youngest, female Atlantic bottlenose dolphins at Bayside, was born on July 14th, 2015. Much like her mother Samantha, Luna quickly stole the hearts of the staff with her sweet, gentle nature and curious personality. She lives up to her name, as she is easily recognizable by her light gray, crescent-shaped dorsal fin, and big, round eyes. Luna constantly learns new behaviors from her trainers and her mother and impresses the staff with her ability to quickly acquire new information. At only 5 months of age, she began participating in water-work behaviors with her trainers! Luna is gentle but brave, and seems to learn a new behavior every day. She interacts with guests daily in both the Structured and Shallow Water Encounters and, recently, began showing off her jumping skills! In her spare time, Luna likes to toss sea beans up in the air, play with her fellow bottlenose calf playmate, Nyla, and swim tucked underneath her beautiful mama! Stop by Dolphins Plus today to see the lovely Luna! 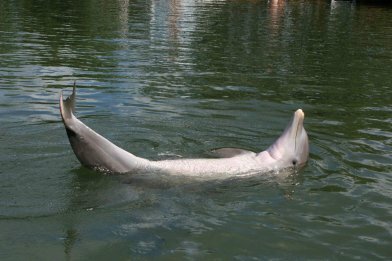 Nica, an adult, female Atlantic bottlenose dolphin, is recognized by her long, slender frame and “sassy” personality. These characteristics earned her the nickname of “Supermodel” or “Diva”, here at Dolphins Plus Bayside! While each dolphin possesses flukes that are unique in shape, size and markings, Nica’s flukes have no notches or unique markings on them, making them “picture perfect”! Her dorsal fin is triangular, much like the sail of a boat. Nica was originally born at Dolphins Plus Oceanside on June 2, 2004. She is extremely quick to pick up on new training and thrives off of learning new husbandry behaviors. Nica’s nicknames include: Squeaky, Pica, Neekies and Cookie! Nica’s favorite thing is having everyone’s attention solely on her! "Nica loves to express excitement through adorable vocalizations that sound like a squeaky toy. These squeaking, chirping sounds have earned her the nickname "Squeaks"!" Nyla, one of Dolphins Plus Bayside's youngest dolphins, is a spunky female Atlantic bottlenose dolphin, swimming her way into the hearts of the Dolphins Plus family. Nyla was born on July 24, 2015 to Nica and Alfonz. She is dark grey in color, like her mom, and sports bright white rings around her eyes and a round yellow rostrum, like her dad. When she's not busy cruising the lagoon with her buddy, Luna, or collecting sea beans from the mangroves, she is quickly gaining the reputation of Bayside's ballerina, impressing trainers with her twirls, splashes, and jumps! She is a bright young student, who is quickly becoming a pro at our Structured swim program. Nyla is incredibly outgoing and often found cruising the docks, watching the trainers, and showing off her newest vocalizations. Stop by Dolphins Plus Bayside today to meet this fabulous little lady! 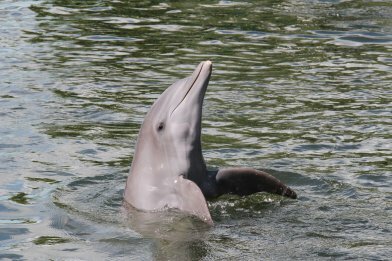 Samantha, an adult female Atlantic bottlenose dolphin, is the eldest member of our dolphin pod at Dolphins Plus Bayside. She can be recognized by her jagged dorsal fin and football-shaped hole in her right fluke. Many of our guests are able to recognize Samantha by her infamous offset jaw. This key trait, along with her expressive eyes and sweet mothering personality make her a guest favorite. Samantha loves showing off her high-flying jumps and squeaky vocalizations. She is frequently seen swimming around the lagoon with her daughter, Luna, tucked below her. Her trainers have given her many nicknames including: Sammie, Mommy Potato, and Baloney! "Samantha’s favorite thing to do is cuddle with her trainers in the shallow water areas of her lagoon! I love my snuggle time with Samantha." Zoe is a female Atlantic bottlenose at Dolphins Plus Bayside. She was born on July 14th, 2010 at Dolphins Plus Oceanside, where she lived until early 2014. Zoe currently lives with her half sister, Nica, and her pointy rostrum and petite body make her easy to identify. She is the only female member of our pod to sport a pink belly, which is a trait inherited from her mother, Jessica, who resides at Dolphins Plus Oceanside. Despite her small size, trainers describe Zoe as fearless. Zoe loves to feed off of trainers’ and guests’ enthusiasm and often responds with adorable vocalizations of her own. You can often see Zoe’s excitement through her large and expressive eyes! "Zoe is a vivacious and independent little girl who can stand her ground with the best of them, but she still loves to snuggle in my arms!"